With hydroponics, complete, balanced nutrition is easy. In fact, that's what hydroponics is all about - delivering nutrients directly to the plant without the growing media getting in the way. Ordinary growing materials (such as bark, moss, etc.) change over time. As these potting materials breakdown, their chemistry is altered and important elements your plant needs for healthy growth can be blocked. You have no way of knowing what your plant is actually getting because the growing media is getting in the way. And the growing media (LECA pebbles) are cermaic and never breakdown or decompose. That means your plant hydroponic fertilizers always contain the entire group of nutritional elements plants need - in a form the plant can use immediately. Don't get overwhelmed with all the nutrient concoctions you see for hydroponics on the Internet. You can grow prize winning plants without them. Conventional media such as bark and moss compact and deteriorate over time. 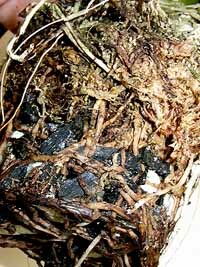 Decaying potting materials trap impurities. This alters the chemistry at the roots and blocks many nutrients from getting to the plant. Your plant is not only robbed from getting what it needs - the unused nutrients turn to salt and eventually become harmful to the roots, whic can kill your plant. If your growing media is bark or moss, your fertilizer could actually be harmng your plants! The only solution is replacing the media. Hydroponic Advantage: In our system, LECA pebbles replace all other media. LECA pebbles are a sterile ceramic that will never compact or decompose. You'll never get "exhausted media" with LECA, eliminating the "trapped nutrients syndrome". Removing impurities from the grow pot is just as important as adding nutrients. The only way to remove the impurities with traditional growing methods is repotting the plant with new media. 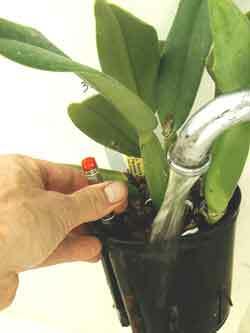 This disturbs the plant's roots and quickly becomes time consuming as your orchid collection grows. Hydroponic Advantage: Removing impurities at the roots is easy with hydroponics. Simply take your plant to the sink every couple of months (or use the garden hose if outdoors) and leach the pebbles thoroughly. The relatively smooth outer shell on the pebbles allows any foreign matter to wash away. This is impossible with bark or moss. 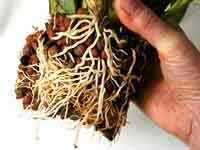 Decaying roots trap impurities and block air flow, making balanced nutrition impossible. 3. 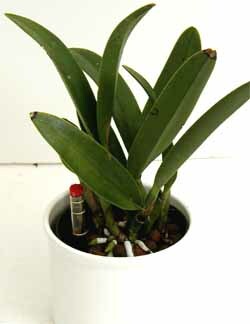 Return plant to outer pot for a fresh start. Many fertilizers rely on the growing materials to provide some of the nutritional elements needed for growth. (Read the label - there should be 16 elements inside.) Relying on the media for nutrition is risky because the chemistry of the potting media is constantly changing (decomposing) and ther's no way of knowing what your plant is actually getting. Hydroponics doesn't rely on the potting mix for any nutritional value. That means hydroponic fertilizers have all 16 nutritional elements plants need for healthy growth.